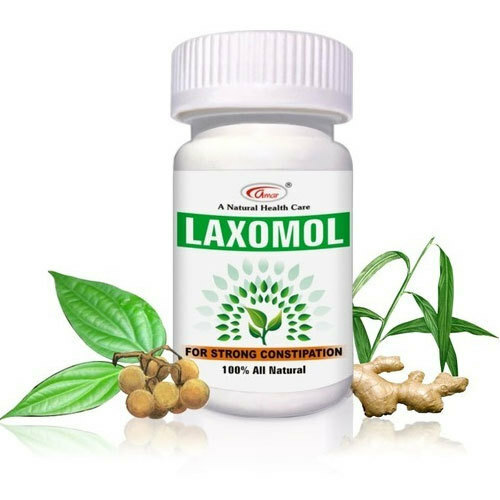 Relieves constipation: The natural ingredients in Laxomol soften the stool and enhance intestinal motility, which relieve acute and chronic constipation effectively. Due to its laxative property, the drug assists excretion without upsetting the fluid-electrolyte balance (mineral and water balance) in the body. Laxomol is non-habit forming and does not result in physiological dependence. Other actions: For effective preradiographic bowel preparation, Laxomol in conjunction with Amar Pharmaceuticals Gasomex, eliminates gas shadows, ensures better radiological interpretation and avoids repeated exposures. The drug is also a carminative that treats indigestion and stimulates the gastrointestinal tract. Constipation during postoperative and non-ambulatory periods. Saunth is a mild laxative that treats constipation of varied etiologies. Kali Mirch Pipal is revered in Ayurveda for its natural laxative property, which does not interfere with normal intestinal physiology. As a prokinetic agent, the herb stimulates intestinal motility and smooth muscle contraction, causing increased intestinal peristalsis. This action aids digestion and the absorption of food.